There are many myths and legends attendant to a belief by some through the centuries that the earth contains a natural hollow at its center, and that in this hollow exists another world domain, populated with human or human-like beings living in a Utopian fashion. The vision of the legendary "Shamballah" is one such version of this concept. It was widely publicized through esoteric circles in the past that Admiral Byrd briefly flew into the rim of the inner earth portal at the South Pole in the early part of the 20th century. It was said that he filmed what he saw from the aircraft...a lush vegetation with what appeared to be mammoths grazing on the flora. This silent and very primitive film was shown in theaters around the United States for a short period before the U.S. government put a stop to it. A few people who saw the film at that time were interviewed in the 1950's before their deaths. Whether or not all this actually happened, I do not know. A little over 30 years ago I began to have my own experiences with the inner earth...or so I believed (and still do). 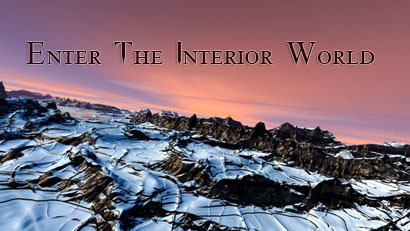 I experienced vivid "tours" of the Interior in my mind, which certainly could have been imagination. However, at the same time I was also receiving cosmic sciences and other akashic information that was being validated in many different ways. Several scientists (two of whom had been protégées of Einstein) were quite interested in the science I was receiving. I mention this, as since the "inner earth" experiences were happening concurrent with my adventures in science, it would seem to lend some credibility to the former. In 1980, I began a quarterly publication which I titled "The Source." It began as strictly on the inner earth, but after a few years expanded out from that, and in 1989, became "Temple Doors," which proceeded into 1999. It is my desire with this inner earth addition to the "Earth Chronicles" section of SPIRIT MYTHOS, to introduce my akashic perspective on the interior domain of this planet and its inhabitants. I stress (as I do with all of my work) that this is my perception...my personal insight into the akashic of the earth. First, in order to understand what I am perceiving as "inner earth," I present the following. According to my insights, we are constantly moving through not only space but also time and dimension. When we pick up our fork or walk from the couch to the kitchen, we are changing our time and dimensional zones to some degree. This change for such a small movement is very, very little. Not being a mathematician, I am unable to give you the real fractions on it, but it is so minute as to effect only a slight adjustment in 1% of the rotation of an atom! However, as tiny as that might be, "little" can be powerful when it comes to shifting perception and thus reality. When we travel from New York to Cairo, we create a greater time and dimensional shift (and I am not addressing the change of established time zones). It is still minute, but it does affect our perceptions. I am sure you have noticed this in taking long-distance journeys, but perhaps thought it was only jet lag and adjusting to another cultural lifestyle around you. Certainly these are contributing factors, but according to my understanding, these additional factors are actually distracting you from the true impact the time / dimensional shift is having on your biological system. Astronauts experience this with even greater impact...especially in the days of the moon trips. Now let us look at a journey to the inner hollow of this planet with the same perception. The north and south poles of the planet form a vortex portal to the Interior. However, this vortex is highly magnetic and warped at the poles of the earth, and not suited for a simple stroll through the door, so to speak. Markers by surface earth explorers have been placed at the "exact point" of "North" and "South" in these regions, proclaiming these points as the actual poles. Yet from my view of things, our whole planet...our whole UNIVERSE and ALL it's spheres are whorls of energy interacting in various rotations and alignments to form what we experience as "solid matter." In this context, the highly magnetic "poles" warp the energies of our planet along the central axis of the magnetic shell we choose to experience as "matter." When we walk on or fly over the magnetic poles of our planet we are really just going around the edges of the magnetic whorl / vortex. In order to ENTER it we must "catch the wave" just right, as Admiral Byrd may have inadvertently done in the early 20th century. What happens if we do? Suppose you are flying in a plane near the lip of the vortex and you find a thread into the opening. Obviously the odds of doing this accidentally are slim, but apparently (if the Byrd story is true) not non-existent. What greets you...munching mastodons? Not necessarily. First of all, just moving inside the lip of the vortex does not place you into the hollow earth. At this very outer region of entry you would experience (as I believe Byrd might have done) a moving field of space / time through which you could see and experience either the past or the future of this planet. If you knew how to follow the space / time thread through the lip of the vortex (as do ultra and inner terrestrial merkabah / vehicles) you would eventually move through the warp zone and into the hollow earth. Here you would find a world that is still slightly removed dimensionally from our own, as it is not only a greater distance than from the couch to the kitchen, but it is also in a much denser and more active magnetic zone (or zones within zones), which amps the whole space / time / dimensional shift. There are other ways to reach the Interior...through caverns, leading to partially natural, partially man-made tunnels. Yet the same shift would take place for individuals making such a difficult journey. Without an inner earth guide, they would probably perish by cellular degeneration as they moved through erratic magnetic zones. I believe that with "help" there have been surface earth persons who have traveled this route to the Interior successfully in the past. There are many cavern cities and communities "on the way down," yet when the Interior is reached, one is presented with a really incredibly beautiful and very diverse world. The dramatic diversity stems primarily from the various and strong magnetic anomalies caused by the interior "sun" at the inner world center, which contains a very specific pulsating magnetic field which effects the environment around it. This lends to the inner world the pseudo-qualities of the earth rotating around its solar sun. There are also quite a lot of differences as well. One may go 5 miles from a dense lush, tropical forest and arrive quite suddenly (almost like walking through a wall) inside a topsy-turvy vortex of ice crystal skies over a barren, perma-frosted desert. Time /space / dimension is very loose in the Interior. There are regions that move so freely back and forth through time, they are not inhabited, except by those who specifically work with and in those "time-threading" zones. In conclusion - and I stress this - physically traveling to into the inner earth as a goal in life is not something I wish to encourage. Being PRESENT in this world we live in is far more important. Being aware that many realms compose the ONE of earthly experience is my message with the whole of SPIRIT MYTHOS. This awareness may help individuals to realize that ALL these dimensions are also within them. There is no need to go outside the self to find what you are seeking. In fact I do not believe it can be found that way. Being in the present moment is where they all come together for each of us and for the world as a collective whole. In creating this portion of the Spirit Mythos Earth Chronicles, I will be utilizing my digital art and perceptions to reveal this inner world through my akashic lens. I will continue to add to this section and post these updates on the Spirit Mythos Updates list.